RSA Biomedical is the world’s foremost provider of Tantalum Markers / Tantalum Beads, and Tantalum Marker Injectors. Our UmRSA® Injector™ and UmRSA® Tantalum Markers™ are well proven, are used in hundreds of RSA® studies, and meet the highest standards of quality in medical research. The UmRSA® Injector™ is designed to help surgeons easily insert spherical UmRSA® Tantalum Markers™ in the skeleton. It is a well-balanced and robust tool, developed in collaboration with medical experts having extensive experience in RadioStereometric Analysis (RSA®). For percutaneous insertion of Tantalum Markers. 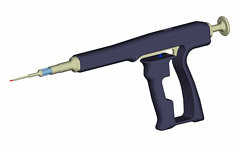 The UmRSA® Injector™ is ergonomically designed to help surgeons insert markers accurately and efficiently. The UmRSA® Injector™ is easy to dissemble, sterilize, assemble, and load. It uses a spring-loaded punch to force markers into the skeleton. The UmRSA® Injector™ is available in two sizes, for 0.8 mm and 1.0 mm UmRSA® Tantalum Markers™. Skeletal and prosthetic device markers used in the UmRSA® system are made of biocompatible spherical tantalum, a material that is well tolerated by the body and readily observed as a distinct point in the radiograph. RSA Biomedical offers 3 sizes of UmRSA® Tantalum Markers™, in diameters of 0.5, 0.8, and 1.0 mm. UmRSA® Tantalum Markers™ are also known as RSA® Tantalum Beads, UmRSA® Tantalum Beads, or RSA® Tantalum Markers.